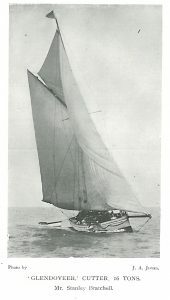 Glendoveer, Cutter 16 tons. Mr. Stanley Bratchell. Was born in 1872, and educated privately at his home in Essex. He afterwards entered the mining business, and is well known in connection with South African and Australian mining. He owns the cruiser Glendoveer, 17 tons, which he uses a good deal in the Channel. He also owns the Clytie, a 7-ton cruiser. Address: 214, Mansion House Chambers, E.C.